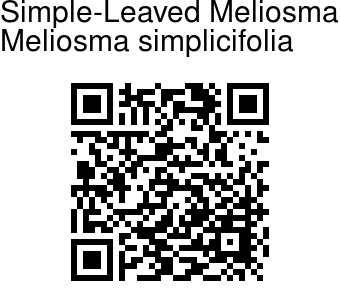 Simple-Leaved Meliosma is a small tree, 4-5 m tall. Young shoots are reddish-velvet-hairy/ Leaves are simple, oblong-lanceolate to oblanceolate-obovate, 7-40 cm long, 2-16 cm broad, leathery, densely coppery pubescent when young, coarsely to sharply toothed or entire, long-pointed, wedge-shaped at the base, with 7-22 pairs of nerves, stalk 1-2 cm long, velvety. Flowers are borne in panicles at branch ends, 10-40 cm long, branched 3 or 4 times, axis nearly triangular. 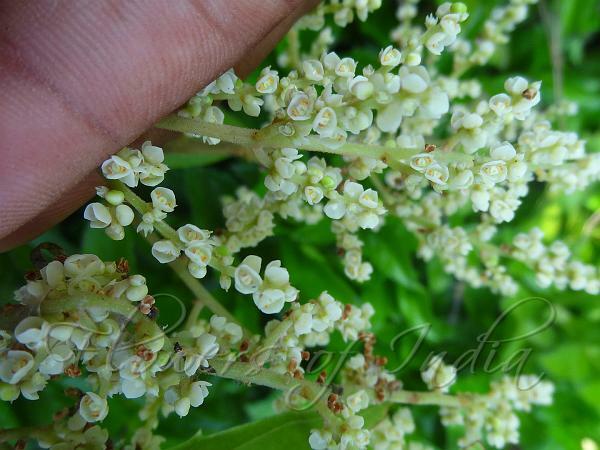 Flowers are white, about 4 mm across, stalkless, bracteoles 3 or more, sub-orbicular, imbricate. Sepals similar to and larger than bracteoles. Outer petals orbicular, entire, inner petals with 2 patent lobes at apex. Stamens adnate to petals. Ovary glabrous; style as long as or slightly shorter or longer than ovary. Drupe is nearly spherical, about 6-8 mm in diameter, black. Simple-Leaved Meliosma is found in Indomalaysia and China at altitudes of 1200-2000 m, and in the Western Ghats. Flowering: April-June. Medicinal uses: In Kerala, mothers eat fresh tender bark after delivery for contraction of uterus.